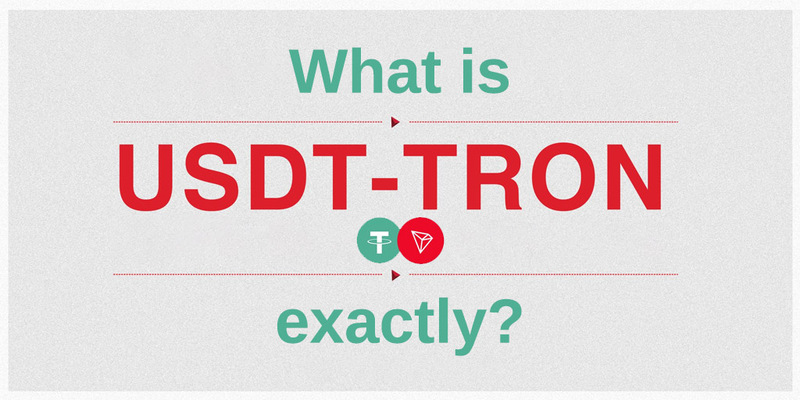 Home Information What is USDT-TRON exactly? You probably saw a lot of mentions on USDT-TRON lately but couldn’t find much info about it. In this post, we will briefly go over USDT-TRON and learn what Justin Sun’s USDT-TRON $20M incentive plan means. If you have been interacting with cryptocurrencies for some time, you have probably heard of Tether. Tether converts cash into digital currency, to anchor or tether the value to the price of national currencies like the US dollar, the Euro, and the Yen. So, USDT stands for USD Tether. Every tether is always 100% backed by Tether reserves, which include traditional currency and cash equivalents or other assets and receivables from loans made by Tether to third parties. Every tether is also 1-to-1 pegged to the dollar, so 1 USD₮ is always valued by Tether at 1 USD. Anyone can check Tether’s proof of fund on their official website. Now that we are clear on USDT, what is USDT-TRON exactly? 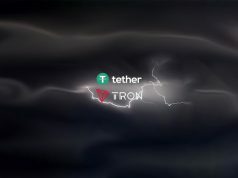 TRON and USDT have announced a partnership to introduce USDT to the Tron network. The TRC20-based USDT (USDT-TRON) will be interoperable with all Tron-based protocols and DApps, making stablecoin transactions faster and free-of-cost, while also improving the use-cases of the stablecoin. 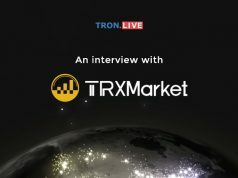 We also received many repeated questions from Tronics on weather USDT-TRON will be on Binance (the world’s largest cryptocurrency exchange by trading volume). As of now, Binance has not made an announcement on this yet so make sure you are following their social media accounts for the latest updates. Do make sure you check out the exchanges official website on when USDT-TRON will be made available. Do not fall for scam announcement that does not come from official sources. What is USDT-TRON $20M incentive plan? The Founder of the Tron Foundation, Justin Sun recently tweeted a $20 million incentive plan for USDT-TRON. In order to qualify, you will have to swap your USDT-Omni to USDT-TRON from 30th April to 7th August on supported exchanges listed above. Some may be confused about what USDT-Omni is, in short, it is the existing USDT that you are familiar with. USDT-Omni is based on the BTC network. The protocol used by USDT-Omni is the Omni layer protocol built on the BTC blockchain network. The initial Annual Percentage Rate (APR) for holding the USDT-TRON will be 20%. Over the course of this time, the APR rate will decrease from 20 percent to 1 percent, by the end of the 100-day campaign. 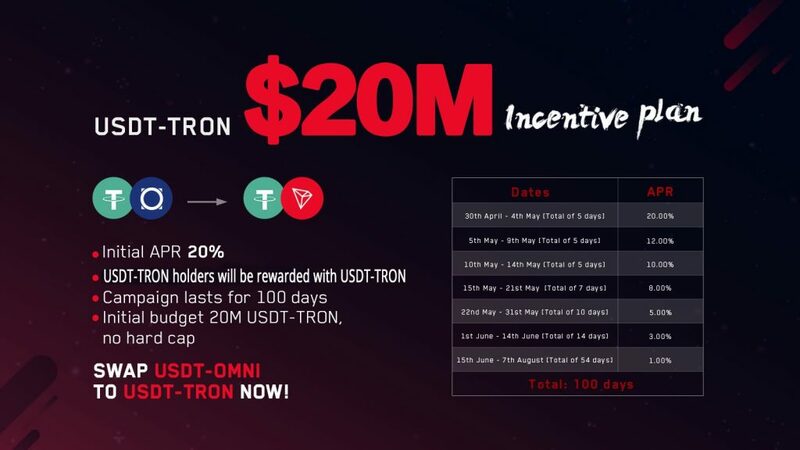 This incentive plan aimed to migrate the users on the USDT-Omni network to the Tron network. Since USDT-TRON will be running on TRON network, users will have the same free transaction and transfer fee on blockchain as other TRON token. Users will also be able to transfer stablecoin across the within seconds as opposed to hours on the original bitcoin network. The introduction of USDT stablecoin on TRON will also make the TRON blockchain as a whole more amenable to enterprise-level partners and institutional investors.